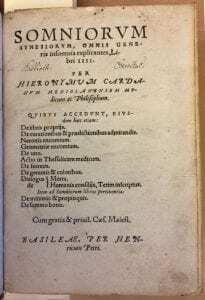 Hundreds of books now in the College’s heritage collections were published long before our library was founded in 1698, and some the oldest and most treasured items in our collections did not arrive here until late in the 19th century. This means that lots of our books have had previous owners, and were presumably read and used by those owners. When cataloguing our rare book collections today, we always look out for evidence of former use and try to piece together the history of each book. 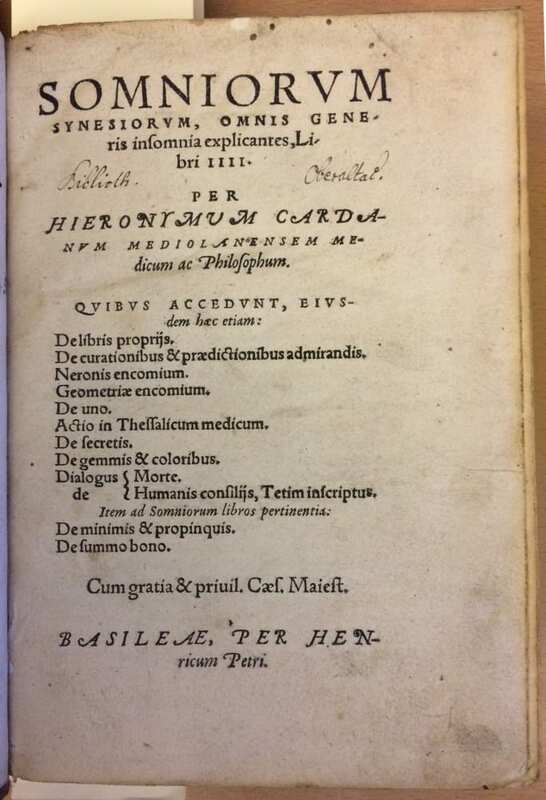 One such book has recently been recatalogued in order to record some newly discovered information about its provenance: Somniorum Synesiorum, omnis generis insomnia explicantes, libri IIII (Synesian dreams, dreams of all kinds set forth, in four books), by the Italian physician, mathematician, and all-round polymath Girolamo Cardano (1501-1576). This work on the interpretation of dreams is inspired by the philosophy of Synesius of Cyrene (c.370-c.413), particularly Syensius’s treatise, De insomniis (On dreams). Cardano divides dreams into four categories, based on their causes: digestive dreams, caused by food and drink; humoural dreams, caused by imbalances in the four humours; anamnestic dreams, caused by passions or changes in emotion; and finally prophetic dreams, which are of a supernatural or divine origin. Cardano views the first three categories as natural and ordinary bodily processes and even, speaking as a physician, ascribes them some measure of diagnostic value. The lion’s share of the text, however, is devoted to discussion of the latter category, which Cardano deliberately approaches from a philosophical, rather than medical, point of view. The book was published in Basel in 1562, but our copy didn’t arrive in the Faculty library until sometime around the 1890s, with quite a few inscriptions and marginal annotations already dotted throughout the text. 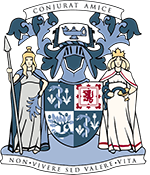 That leaves over 330 years between the publication of the book and its purchase by the Faculty – so where was it all time? 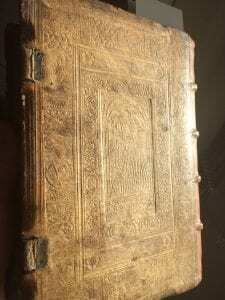 A partial answer can be found on the title page: near the top of the page there is an inscription, “Biblioth. 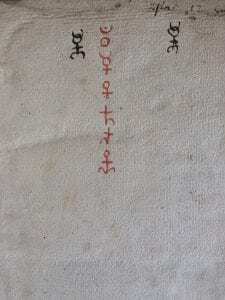 Oberaltai.”, indicating that the book once belonged to the library of the Kloster Oberalteich, or Oberalteich Abbey. 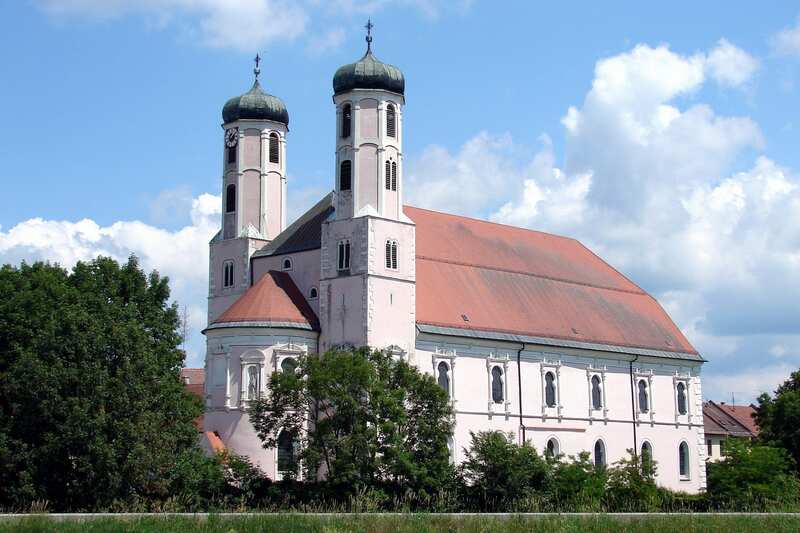 This was a Benedictine Order in Bogen, Bavaria, founded at the beginning of the 12th century and eventually dissolved in 1803. The former monastery, which was built in the 1620s, subsequently became a parish church and still has an active Catholic congregation today. Although we can’t be certain, it’s possible that the book had been in the abbey’s possession since shortly after publication; the decorations on the pigskin binding are similar to those found on other German bindings of the period. The leather has been marked using a mixture of blind stamp tools, including panels, rolls, and lettering. These impressions are quite difficult to make out now, but in raking light it’s possible to see some of the detail. Two rolls are used: a larger one depicting repeating portraits of St Paul, David, John the Baptist, and Christ Salvator each with a motto imprinted underneath, and a smaller roll depicts a number of unidentified heads in medallions. The rolls form concentric rectangles on both the front and back boards, with a different panel image stamped in the centre on each side. On the front we see Justitia with the accompanying lines ““IVSTICIA [QVISQVIS] PICTURAM // LVIMNE CERNIS DIC DEVS // IVSTVS [IVSTAQVE] FACTA PROB” and on the back there is Lucretia with the text “CASTA TVLIT MAGNAM FORM // LVCRECIA LAVDEM FACTA TAMI // MAGNO EST VVLNERE CLARA SV”. 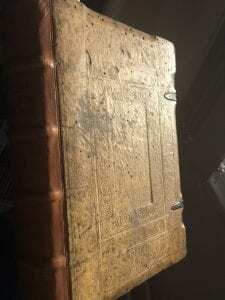 The book was rebacked (i.e. given a new spine) in more recent years, probably around the 1950s or 1960s. 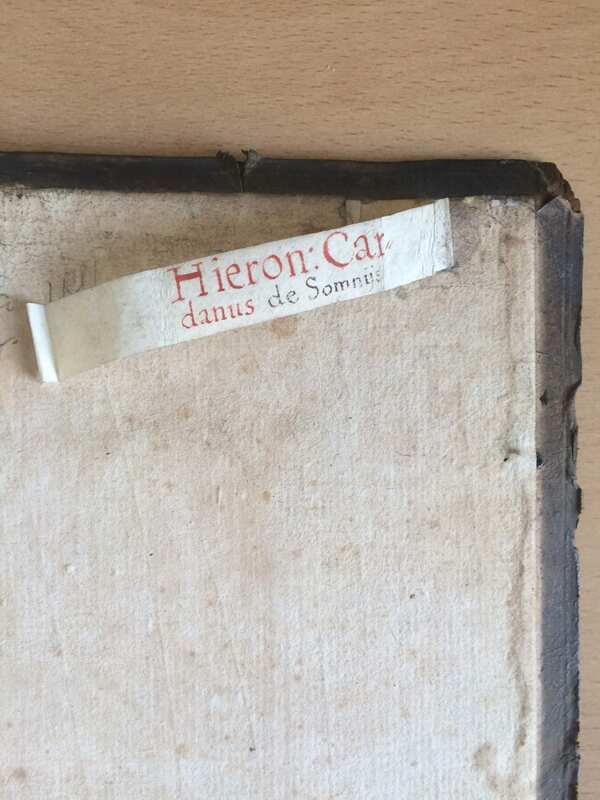 The binder has, however, been careful to preserve a fore-edge label, attached to the rear pastedown. 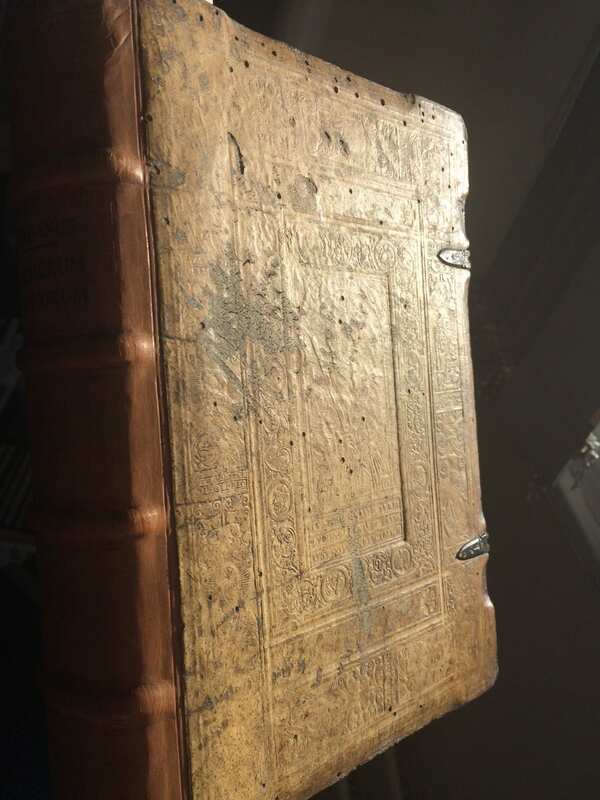 This label suggests that, while the book was in the Oberalteich Abbey, it was probably shelved with its fore-edge facing out, rather than the spine. Some more curious evidence of former use can also be seen on the front flyleaf (the blank page between the front cover and the title page), where we find a number of alchemical symbols written in black and red ink. The symbols are all recognisable (using a resource like the Royal Society of Chemistry’s periodic table of alchemy we can identify mercury, lead, copper, arsenic and gold) but sadly we’ve so far been unable to decipher a recipe for transmutation. Assuming this book was dispersed along with all the other possessions of the dissolved Oberalteich Abbey, we are still left in the dark about its whereabouts between 1803 and the end of the 19th century. It’s possible that we’ll never fill in this gap, but it’s nonetheless gratifying to be able to uncover and share some of the early history of this volume. 1. Browne, Alice. “Girolamo Cardano’s Somniorum Synesiorum libri IIII.” Bibliothèque d’humanisme et renaissance 41.1 (1979): 123-135. 2. Cardano, Girolamo & Stoner, Jean (translator). The Book of My Life : (De Vita Propria Liber). E.P. Dutton & Co., 1930. 3. Giglioni, Guido. “Review: Synesian Dreams. Girolamo Cardano on dreams as means of prophetic communication” Bruniana & Campanelliana 16.2 (2010): 575-584. 4. Morley, Henry. Jerome Cardan : The Life of Girolamo Cardano, of Milan, Physician. Chapman and Hall, 1854. 5. Rupprecht, Carol Schreier. “Divinity, insanity, creativity: a Renaissance contribution to the history and theory of dream/text(s).” In Carol Schreier Rupprecht (ed. ): The dream and the text. Essays on Literature and Language. SUNY Press, 1993. 6. Siraisi, Nancy G. “Girolamo Cardano and the art of medical narrative.” Journal of the History of Ideas 52.4 (1991): 581-602. 7. Waters, William George. Jerome Cardan : a Biographical Study. Lawrence & Bullen, 1898.